What better way to forget the Polar Vortex days than with Toronto’s sweltering summer months? During the hottest time of the year, there’s no better way to cool off than trying out a new ice cream shop. However, deciding where to get ice cream in the city can be quite the daunting process. Read on to discover how to track down Toronto’s best ice cream at any of these ten spots. Scoop Shop on Dundas West boasts natural, organic ingredients, sourced via connections with local farmers markets. Their daily ice cream flavours, waffle cones and cookies are all made from scratch on-site. While it’s a tiny shop, it makes up for little sitting space by being walking distance from Trinity Bellwoods, making it perfect for ice cream followed by a stroll in the park on a summer day. 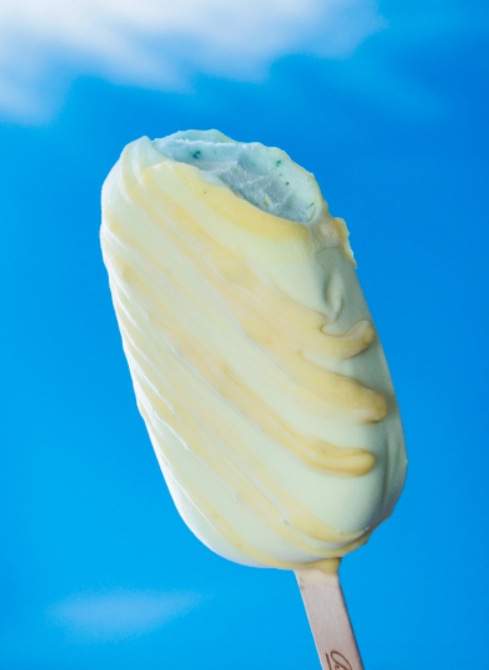 Their ice cream has no artificial colourings, so although the flavours look almost the same, each has a distinct taste. 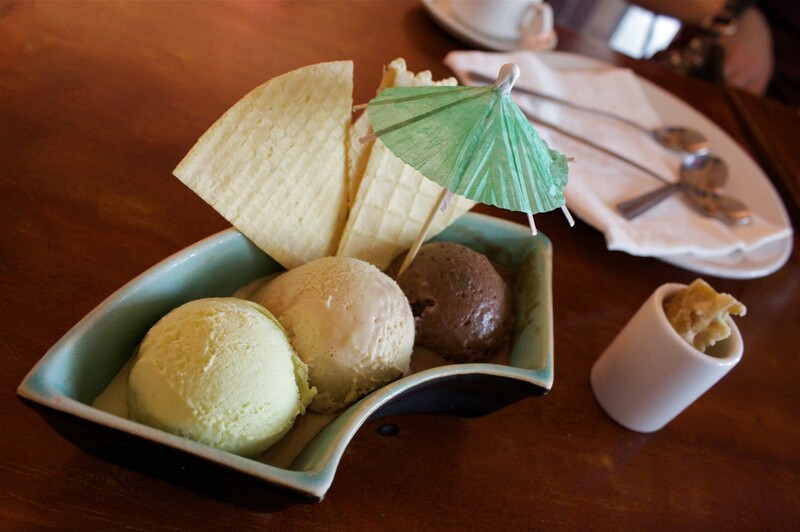 Eva’s Original Chimneys mixes two of America’s most popular desserts; doughnuts and ice cream. Their specialty, Chimneys, are freshly baked Hungarian pastries with a crunchy outside and a soft inside. Eva’s offers not only a satisfying treat but also a visual experience, as the Chimney Cakes are baked using a traditional-style, open rotisserie grill, just like on the streets of Budapest. Another bonus – the pastries are made using organic ingredients and a vegan base. Try an Original Chimney Cone (aka ‘Doughnut Cone’) filled with real-cream soft-serve ice cream for $8. Bar Ape is a taste of Italy packed into a 40-square-foot food truck. Bar Ape puts a spin on traditional handmade gelato by serving it in the form of chocolate-dipped bars. Bar Ape is the place to go for a unique take on gelato, offered in popular flavors like pistachio and hazelnut chocolate. There’s also a wild card flavor that changes depending on what’s in season. Ossington, David Pecaut Square and Queen West are areas where Bar Ape can often be found, but they have set up permanent shop on Rushton road. Boasting long lineups, Sweet Jesus is a tiny shop with industrial decor, offering espresso and soft-serve ice cream with out-of-this-world toppings. Sweet Jesus also promotes street artists and their work, creating an urban atmosphere inside. The main attractions here are the elaborate and wacky ice cream cones, offered in creative flavors like Rocky Road Rage (a twist of chocolate and burnt marshmallow soft serve with chocolate sauce, marshmallows and cashews) and The Elvis (banana soft serve drizzled with peanut butter topped with candied bacon bits). 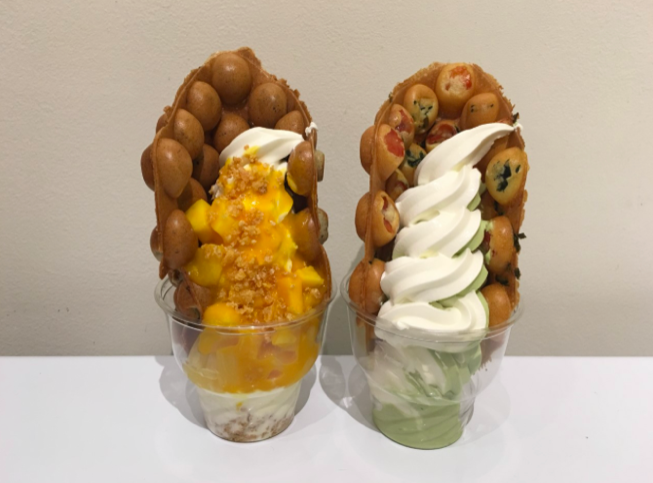 Wooffles & Cream has a unique concept when it comes to ice cream – they serve a selection of sweet and savory Hong Kong–style egg waffles with soft serve ice cream. For the adventurous, Wooffles’ specialty is the highly recommended Lap Cheung waffle ($4.50), which contains Chinese sausage and seaweed. The waffle is fluffy with crisp edges and is said to pair well with ice cream for a mix of salty and sweet flavors. There is a range of waffle choices, all catering to different tastes, from exotic flavors like salt and pepper to more mundane ones like cookies and cream. Bang Bang is perfect for satisfying an ice cream sandwich craving. There are countless combinations of flavors from cookie type, including Birthday, Oatmeal and RoCocoa, and ice cream flavors, including Orange Cardamom, Lemon Meringue, London Fog and Burnt Toffee. Try a full sandwich with two cookies for $7 or a half sandwich with one cookie for $4.50. The vaulted ceiling and white tiling create an old-fashioned atmosphere, completed by the bags of flour, ovens and mixers. Greg’s Ice Cream is a cute little ice cream shop with outdoor seating located at Bloor and Spadina. Sometimes referred to as the Holy Grail of ice cream shops, Greg’s offers over 100 flavors of ice cream, including Cinnamon Nutmeg, Roasted Marshmallow, Pumpkin Raisin, Chocolate Ginger, Licorice and Chocolate Peanut Butter, all made using natural ingredients. Go for a banana split for $8.50, or build a personal shake or sundae. Alternatively, take home a tub of ice cream for $9.99 a liter. 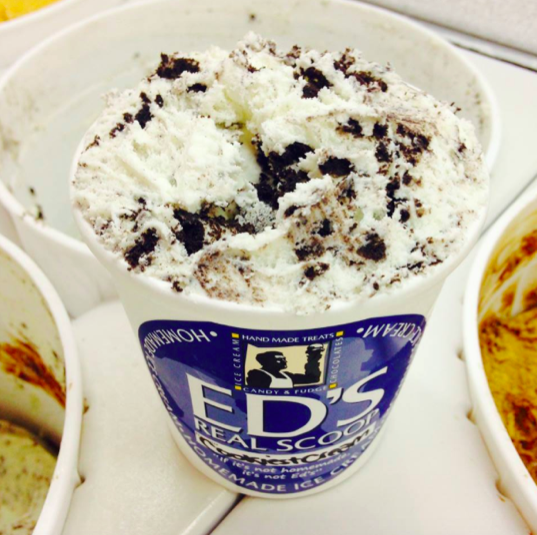 Known for their rich, creamy ice cream, Ed’s Real Scoop is the perfect treat for a sweet tooth. The ice cream is made from Ontario milk and cream and churned at exceptionally low speeds, resulting in a dense texture containing a minimum amount of air. 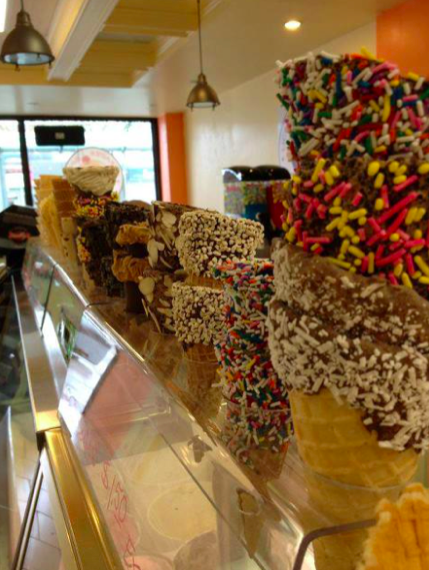 Ed’s offers over 100 flavors to choose from, which change almost every day. There’s something for every ice cream lover, whether they’re craving sundaes, milkshakes, floats, affogatos or sorbets. Momofuku Milk Bar is the sister bakery of the famous Momofuku restaurant. Milk Bar puts an American spin on home-style desserts and savory snacks using quality ingredients and local dairy. For the ice cream lover who wants to try something new, order the Cereal Milk Ice Cream, a Milk Bar favorite made to resemble milk and cereal. Located on the second floor of Momofuku Toronto, Milk Bar is a fun and interactive space where customers can select their own fresh-baked goods brought in from their New York City kitchen. Lickadee Split is the ideal spot to take the little ones for ice cream, as it boasts a kid-friendly atmosphere. It is located in Olde East York Village and has rows of outdoor seating, with adult chairs on one side and colorful kiddie plastic chairs on the other. The decor adds to the fun vibe of the shop, with ice cream cutouts on the window and a chalkboard wall. With an extensive list of flavor choices including Birthday Cake, S’mores and Watermelon Sherbet, Lickadee Split is sure to satisfy any ice cream craving.